Here's an update to this post, about a 17th century Messianic prophecy for the year 1840-1, apparently predicting the French Revolution, some kind of Russian revolution, Jewish independence, and then the Messiah. This is a copy of the document discussed in that post, copied for some reason, by Isaac Leeser's. See here. Leeser must have had hopes for the year 5601. This is interesting; an entry for Brian Walton's 1653 - 56 London Polyglot Bible in Kohelet Shlomo - Collectio Davidis, the catalog of Rabbi David Oppenheim's famous library. Interesting, because it includes the New Testament, and the catalog says it was the complete six volumes. 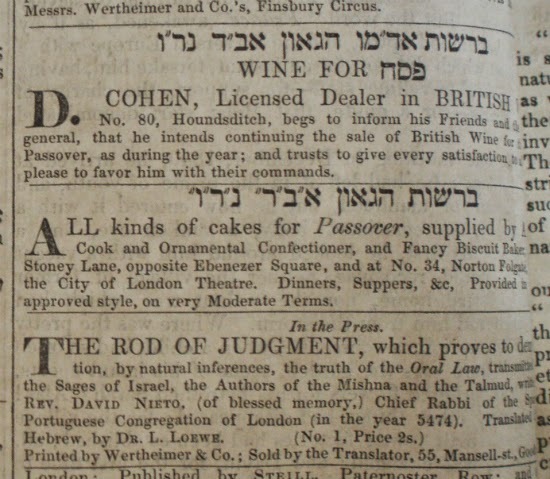 Here's a nice ad for Passover products from 1842, under the rabbinic supervision of Rabbi Solomon Hirschell (1862-1842). From the Voice of Jacob.